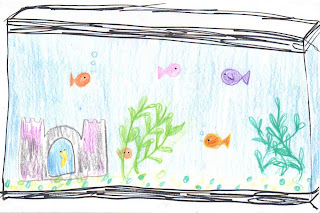 The Poem Farm: What do the Fish Think? Students - Waiting in the doctor's waiting room the other day, I kept looking at the aquarium. It was late at night, but their tank light made it seem bright as day underwater. I could not help wondering what the fish were thinking, wondering if they were looking at me. I am actually still wondering about this. You will notice that this poem does not rhyme. 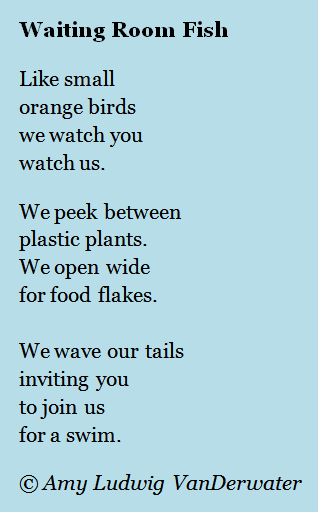 It's just a little collection of thoughts in three stanzas, from the point of view of fishes. 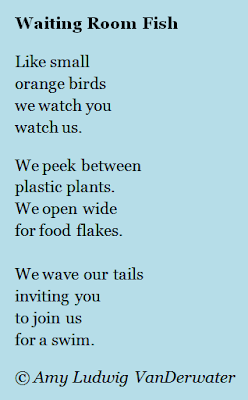 Poets call this kind of poem a mask poem, or persona poem, because when I wrote it, it was as if I was wearing the mask of fish and speaking as I imagine they might speak. You can find many more mask poems like this one (several rhyme) under the tab above, POEMS BY TECHNIQUE. Just look under "mask poems." I plan to return to a more regular schedule here soon, hopefully next week! Love the poem and loved being able to hear you read it! How was NCTE? VANDERWATER AND SIDMAN POWER! So funny! I was at the dentist yesterday thinking he really ought to get rid of the aquarium because the fish look sad! They don't have enough things to play with, and I worry they are neglected. Your poem is simple and lovely - and aren't mask poems so much fun? Always nice to see the other perspective Amy- & I'll be happy to use this as a great example when I might need it. Thanks for a fun poem.